Canon EOS 200D Mirror less Digital Camera with 18-55 mm Combining comparison-detection and phase-detection focusing techniques, hybrid CMOS AF ii gives you fast and unique auto focus competencies to suit working in hard lighting conditions and with transferring subjects. A 49-point AF gadget benefits using focusing aids, which includes face detection and object tracking, for as it should be obtaining and retaining attention on transferring subjects. Disclaimer : Canon Eos 200D 18-55mm DSLR Camera price in Pakistan is updated on daily basis and rate/price for Canon Eos 200D 18-55mm DSLR Camera is valid for all cities of Pakistan included Islamabad, Rawalpindi, Lahore, Karachi, Faisalabad, Peshawar, Sialkot, Quetta etc. 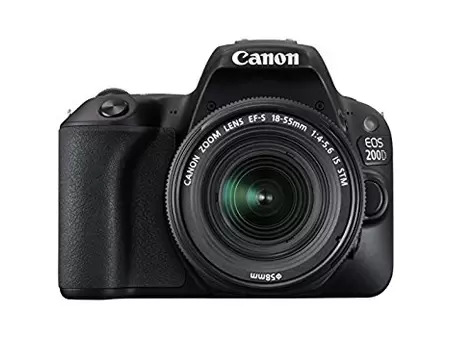 Canon Eos 200D 18-55mm DSLR Camera price depends on many factors thats include the price of dollors, manufacturar price and import cost and duties etc. Our team entered specs from diffrent resources and not responsible for any typo error in specs for Canon Eos 200D 18-55mm DSLR Camera, please report any such error in bug report panel for Canon Eos 200D 18-55mm DSLR Camera. Canon Eos 200D 18-55mm DSLR Camera price in Pakistan.